Lesley Batchelor OBE is an expert on international trade and a passionate champion of UK exporters. She is also the Director General of the Institute of Export, the professional membership body representing and supporting the interests of everyone involved in importing, exporting and international trade. In this article she tells you how to assess your export readiness using a SWOT analysis. A SWOT analysis can be used for many different purposes, from planning your career to entering a new market. For those who don’t know, SWOT stands for Strengths, Weaknesses, Opportunities, and Threats. The exercise of determining each of these within your company is often useful to a business if they rarely take time to plan ahead but spend most of the time looking after their immediate issues. Using this simple grid system will formalise your thoughts and help you to manage your ideas effectively. You can complete this on your own but it is often better if you use it in a brainstorming format and allow your team, family or friends to help you think through the issues that you may need to address. 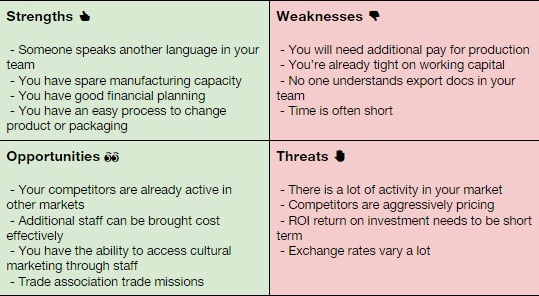 Here is an example of what a SWOT might look like for a first-time exporter. Things that should be planned for the future. Taking control of the issues your business faces will help you to grow and to manage your time in terms of the day to day and the actions that will take you into new markets. Try it for yourself using our SWOT in the Action Planning process where we have given you a template you can fill in.